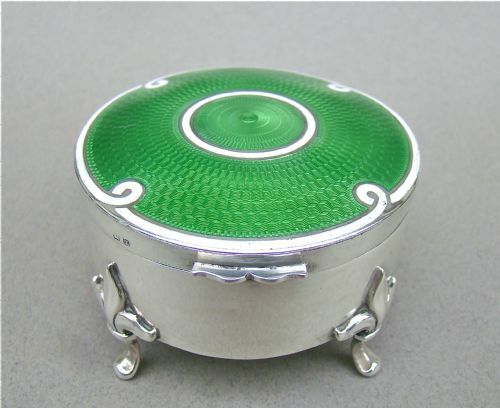 This is a delightful silver mounted guilloche enamel pill box. The hinged silver cover inset with a dark lilac sunburst guilloche enamel background and surrounded by an elegant white border with key pattern silver highlights. The hinged cover opening to reveal a gilt inner lid and base. Date letter "k" for 1909. Enamel in excellent shiny condition. 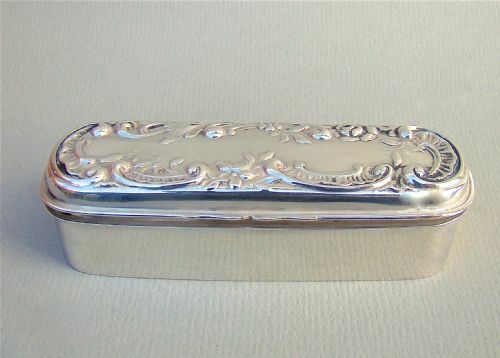 This superb solid silver jewellery box was made in London 1906 by Nathan & Hayes. Of oval form, the plain hinged cover engraved with engine turned decorations surrounding a vacant reserve. The hinged cover with a raised scroll border. GN over RH for Nathan & Hayes. Length: : 10cm / 4 inches. Height: 3cm / 1 inches. 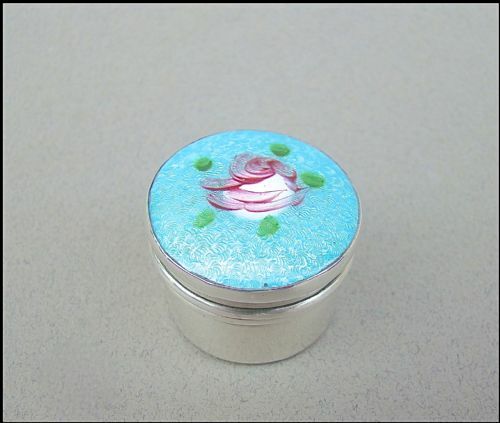 This small Edwardian silver and guilloche enamel pill box has a pale blue enamel circular lid embellished with a rose and green foliage. The pull-off cover opening to reveal the original silver gilt interior. Plain silver sides and base. Diameter: 3cm - 1.2 inch. Height: 2cm - 1 inch. 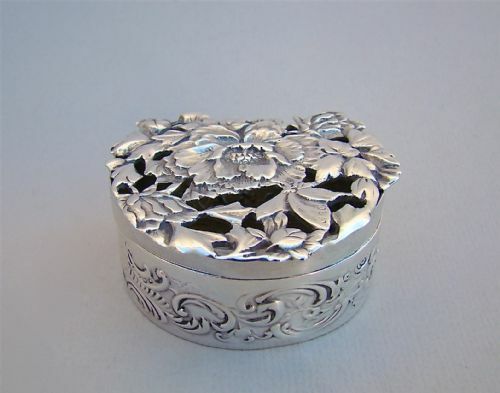 This charming silver pill box was made by Synyer & Beddoes and is dated Birmingham 1899. It has an unusual horseshoe-shaped body with embossed sides and pinched border. The hinged lid with foliate patterns surrounding a vacant reserve. It is charming , useable - it opens and closes well - and still retains its gilt interior. S*B fort Synyer & Beddoes. Date letter "y" for 1899. 3.5cm x 4.5cm / 1.3 inches x 1.3 x 2 inches. 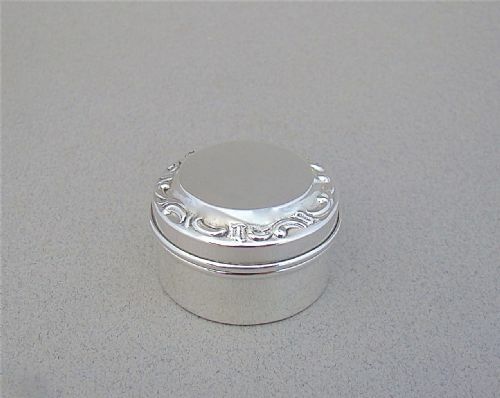 This is an elegant silver pill box. The pull-off cover engraved with a scroll border surrounding a vacant medallion. Opens to reveal a gilt interior. Diameter: 3.5cm / 1.2 inches. Height: 2cm / 0.6 inch. 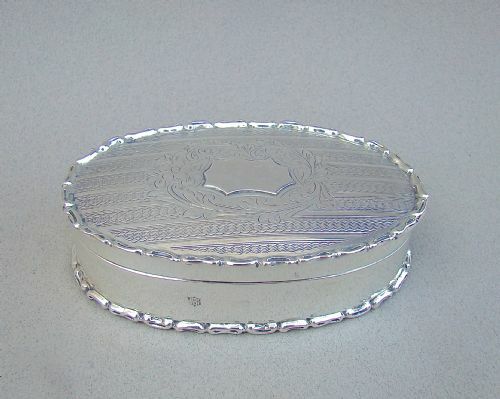 This pretty oval-shaped Edwardian silver trinket box is dated Birmingham 1905 and was made by the reputed silversmith Henry Matthews. The shaped hinged cover embossed with decorative foliate patterns. 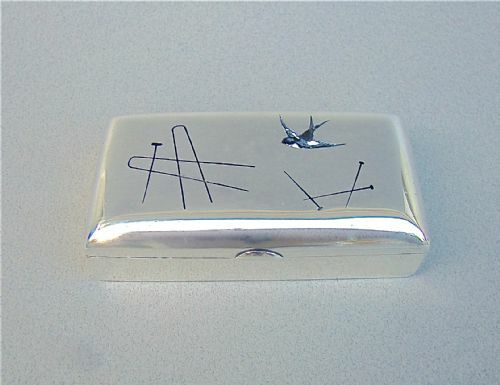 Plain solid silver base and sides. Date letters "f" for 1905. Width: 2cm / 1 inch. To pay via PAYPAL click on button below and add P&P. 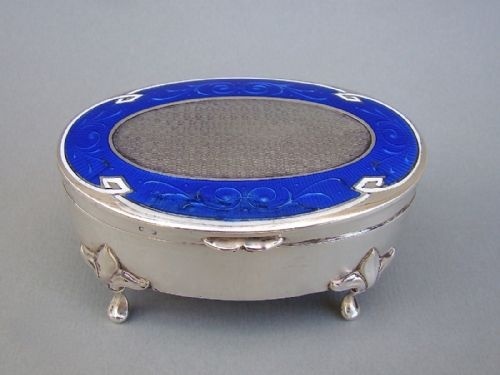 This is a fabulous and rare silver mounted guilloche enamel jewellery box. The silver cover inset with a vivid green engine-turned guilloche enamel background and surrounded by an elegant silver rimmed white border. The hinged cover opening to reveal a gilt inner lid and the original velvet interior. Raised on four elegant cabriole legs. 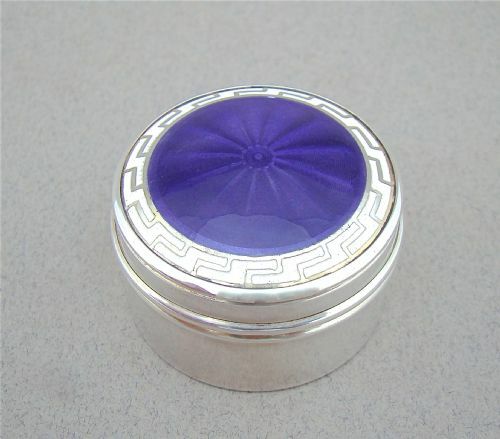 This is a fabulous silver mounted guilloche enamel jewellery box. The silver cover inset with a vivid green engine-turned guilloche enamel background and surrounded by an elegant silver border. Raised on three elegant cabriole legs. GWL&Co for G W Lewis & Co. 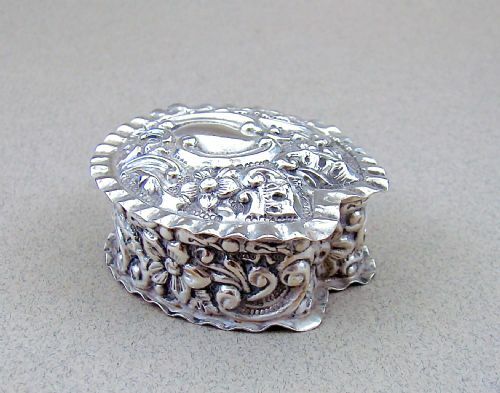 This exquisite and very unusual Victorian silver pin box is dated Birmingham 1897was made by the prolific Edward Souter Barnsley. It has generous proportions and has an excellent silver gauge. The hinged lid enamelled with a swallow in flight amongst pins and needles. The gilt interior divided in three compartments with two gilt removable cylindrical sleeves. E.S.B for Edward Souter Barnsley. This delightful Edwardian silver pot pourri pot was made by the celebrated William Comyns and is dated London 1906. These pot pourri boxes or pots are relatively rare and this is a charming example. 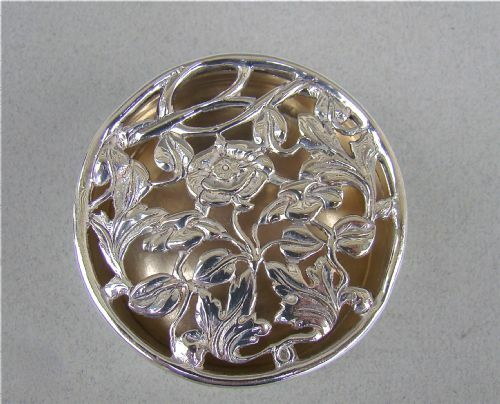 Of semi-circular form, the pull off silver lid cast and pierced with sinuous floral designs. Width: 6cm / 2 inch. Weight: 50 g /1.7 oz. This delightful Edwardian silver pot pourri pot is dated Birmingham 1909. These pot pourri boxes or pots are relatively rare and this is a charming example. Of circular form, the pull-off cover pierced with sinuous floral designs. 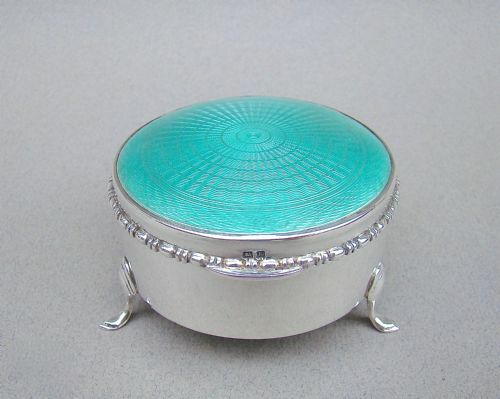 This is a fabulous silver mounted guilloche enamel jewellery box. Of traditional oval form, with a cover inset with a deep lapis lazuli blue guilloche enamel band heightened by an elegant silver rimmed white border. The solid silver centre with engine turned decorations. The hinged cover opening to reveal a gilt inner lid and a Royal blue satin interior. Length: 7cm / 2.4 inches.